The Bombyliidae (bee flies) are one of the largest families of Diptera, with over 5,000 valid species described worldwide. Their high diversity may be due to the parasitoid habit of the majority of their larvae (Du Merle, 1975; Price, 1980; Yeates and Greathead 1996). Adults feed on nectar and pollen, and no doubt feature prominently in angiosperm pollination syndromes (Armstrong, 1979; Grimaldi, 1988; Heard et al., 1990), although few species have been studied in detail. Bee flies occur on all continents except Antarctica, however their highest diversities occur in semi-arid and arid environments (Hull, 1973). This structural diversity is reflected in the higher classification of the family, with a total of 31 subfamilies proposed to date. Up until recently the subfamilies of Bombyliidae were based on classifications formulated early this century, and those divisions did not accurately reflect the cladistic relationships within the family. The subfamilies were divided further into tribes by Hull (1973). Numerical cladistic analyses of particular subgroups of Bombyliidae have appeared only in the last few years (Evenhuis, 1990, 1993; Yeates, 1988, 1989, 1990, 1991a, b; 1994, Yeates and Lambkin 1998, Lambkin et al. 2003). The family was catalogued by Evenhuis and Greathead (1999). Yeates (1992) affirmed Theodore's (1983) suggestion that Prorates Melander showed affinities with the window flies, and moved the entire Proratinae except Apystomyia Melander, to the Scenopinidae, forming the two most plesiomorphic subfamilies, the Caenotinae and Proratinae. 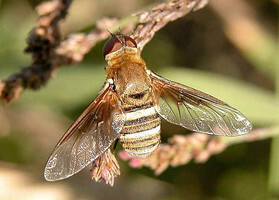 Yeates (1994) placed Apystomyia in the Hilarimorphidae, as the sister family to the Bombyliidae. With the Proratinae removed, the Bombyliidae are a much more homogenous group, however their monophyly remains weakly supported at present. Almost all known larval Bombyliidae are parasitic, and undergo hypermetamorphosis whilst developing through the larval instars (Yeates and Greathead, 1997). This feature was considered synapomorphic for the family by Woodley (1989). Other asiloid fly larvae are free-living predators which do not undergo hypermetamorphosis, however the larval habits of the Hilarimorphidae are unknown. The larvae of at least some members of the bombyliid subfamilies Mythicomyiinae (Andersson, 1974) and Heterotropinae (Yeates and Irwin, 1992) are free-living and do not undergo hypermetamorphosis. These occurrences appear as apomorphic reversals on the cladogram, rather than plesiomorphies. All Bombyliidae have lost wing vein M3 (Hennig, 1973; Mühlenberg, 1971). This apomorphy is not particularly compelling because it also occurs independently within other asiloid families such as the Scenopinidae, Mydidae, and Hilarimorphidae. The occipital chambers are sclerotised pockets on the inner wall of the head capsule adjacent to the occipital foramen (Zaytsev, 1986, 1992). They appear in the most plesiomorphic bombyliid subfamilies, however they are lost in the more advanced subfamilies. Occipital apodemes are internal sclerotised ridges which run dorsoventrally on either side of the occipital chambers. They are only found in the Bombyliidae, but are apomorphically lost in numerous instances, especially within clade 9. The highly derived sperm pump of the female spermatheca found in the Bombyliidae also appears to be apomorphic for the family, although superficially similar pumps appear in some Asilidae according to Theodor (1976). The ultrastructure of the various components of the pump in Bombyliidae has been studied by Mühlenberg (1970). The phylogenetic research of Yeates (1994) resulted in a reclassification of the family which recognised a total of 15 subfamilies in a sequenced classification (Nelson, 1974) shown in the tree above. This classification recognises each successive branch from the backbone of the cladogram in Yeates (1994) as a subfamily. In attempting to make as little change as possible to the existing classification whilst reflecting the cladistic results obtained, Yeates (1994) recognised only one new taxon at subfamily level, the Lordotinae. Some traditional subfamilies such as the Usiinae and Phthiriinae, and Toxophorinae, Systropodinae and Geroninae, form monophyletic branches from the main stem of the cladogram and were united into single subfamilies. The Cythereinae was found to be broadly polyphyletic and some of its components were distributed to other subfamilies. The majority of traditional subfamilies, such as the Mythicomyiinae, Oligodraninae, Oniromyiinae, Anthracinae and Tomomyzinae were monophyletic, forming single branches from the main stem of the cladogram and were retained unchanged. Andersson, H. 1974. Studies on the myrmecophilous fly, Glabellula arctica (Zett. )(Diptera, Bombyliidae). Entomol. Scand. 5: 29-38. Armstrong, J. A. 1979. Biotic pollination mechanisms in the Australian flora- a review. N.Z. J. Bot. 17: 467-508. Du Merle, P. D. 1975. Les hôtes et les stades pré-imaginaux des Diptères Bombyliidae: revue bibliographique annotée. Bulletin. de. la. Section. Regionale. Ouest. Palearctique. (Organisation. Internationale. de. Lutte. Biologique). 4: 1-289. Evenhuis, N. L. 1990. Systematics and evolution of the genera in the subfamilies Usiinae and Phthiriinae (Diptera: Bombyliidae) of the world. E.J. Brill/Scandinavian Science Press Ltd and Bishop Museum Press, Leiden and Honolulu. ---. 1993. Review and phylogenetics of the Antoniinae of Australasia (Diptera: Bombyliidae). Bishop Mus. Occ. Pap. 33: 1-21. Grimaldi, D. 1988. Bee flies and bluets: Bombylius (Diptera: Bombyliidae) flower constraint on the distylous species, Hedyotis caerulea (Rubiaceae) and the manner of foraging. J. Nat. Hist. 22: 1-10. Heard, T. A., V. Vithanage, and E. K. Chacko. 1990. Pollination biology of cashew in the Northern Territory of Australia. Aust. J. Ag. Res. 41: 1101-1114. Hennig, W. 1973. Diptera (Zweiflügler). Pages 337 in J.-G. Helmcke, D. Starck and H. Wermuth, eds., Handbuch der Zoologie. IV Band. 2 Hälfte: Insecta. 2 Teil: Spezielles. 31. Walter De Gruyter, Berlin. Hull, F. M. 1973. Bee flies of the world. The genera of the family Bombyliidae. Bulletin of the United States National Museum No. 286. Smithsonian Institution Press, Washington, D.C.
Exoprosopini (Diptera: Bombyliidae). Invertebrate Systematics 17: 735-891. Mühlenberg, M. 1970. Besonderheiten im Bau der Receptacula seminis von parasitischen Fliegen (Dipera, Bombyliidae). Zool. Jahrb. Abt. Anat. Ontog. Tiere. 87: 471-479. ---. 1971. Phylogenetisch-systematische Studien an Bombyliiden (Diptera). Z. Morphol. Okol. Tiere 70: 73-102. Nelson, G.J. 1974. Classification as an expression of phylogenetic relationships. Systematic Zoology. 22: 344-359. Price, P.W. 1980. Evolutionary biology of parasites. Princeton University Press, Princeton. Theodor, O. 1976. On the structure of the spermathecae and aedeagus in the Asilidae and their importance in the systematics of the family. The Israel Academy of Sciences and Humanities, Jerusalem. ---. 1983. The genitalia of Bombyliidae (Diptera). The Israel Academy of Sciences and Humanities, Jerusalem. Woodley, N. E. 1989. Phylogeny and classification of the "Orthorrhaphous" Brachycera. Pages 1371-1395 in J. F. McAlpine and D. M. Wood, eds., Manual of Nearctic Diptera. Volume 3. Research Branch Agriculture Monograph No. 32. Canadian Government Publishing Centre, Hull. Yeates, D. K. 1988. Revision of the Australian genus Oncodosia Edwards (Diptera: Bombyliidae). Syst. Ent. 13: 503-520. ---. 1989. Phylogenetic relationships of the Australian lomatiines (Diptera: Bombyliidae). Syst. Ent. 14: 491-509. ---. 1990. Revision of the Australian bee fly genus Doddosia Edwards (Diptera: Bombyliidae). J. Nat. Hist. 24: 69-80. ---. 1991a. Revision of the Australian Bee Fly Genus Aleucosia Edwards (Diptera: Bombyliidae). Invert. Taxon. 5: 133-209. ---. 1991b. Revision of the Australian bee fly genus Comptosia (Diptera: Bombyliidae). Invert. Taxon. 5: 1023-1178. ---. 1992. Towards a monophyletic Bombyliidae (Diptera): the removal of the Proratinae (Diptera: Scenopinidae). Am. Mus. Nov. 3051: 1-30. Yeates, D. K., 1994. Cladistics and classification of the Bombyliidae (Diptera: Asiloidea). Bull. Amer. Mus. Nat. Hist. 219: 1-191. Yeates, D.K. and Greathead, D. 1997. The evolutionary pattern of host use in the Bombyliidae: a diverse family of parasitoid flies. Biological Journal of the Linnean Society 60: 149-186. Yeates, D. K., and M. E. Irwin. 1992. Three new species of Heterotropus Loew (Diptera: Bombyliidae) from South Africa with descriptions of the immature stages and a discussion of the phylogenetic placement of the genus. Am. Mus. Nov. 3036: 1-25.
gen. nov. Invertebrate Taxonomy 12(6): 977-1078. Zaytsev, V. F. 1986. Comparative morphological review of the thoracic sclerites in Diptera of the superfamily Bombylioidea. Entomol. Rev. 65: 39-59. ---. 1992. Contribution to the phylogeny and systematics of the superfamily Bombylioidea (Diptera). Entomol. Rev. 71: 94-114. Page: Tree of Life Bombyliidae. Bee Flies. Authored by David K. Yeates and Christine L. Lambkin. The TEXT of this page is licensed under the Creative Commons Attribution License - Version 3.0. Note that images and other media featured on this page are each governed by their own license, and they may or may not be available for reuse. Click on an image or a media link to access the media data window, which provides the relevant licensing information. For the general terms and conditions of ToL material reuse and redistribution, please see the Tree of Life Copyright Policies.